It's the middle of summer and I get a craving for a turkey dinner. When the summer season starts, you can't wait for that first grilled hamburger or hot dog! When November comes, you can't wait for that Turkey! Never a happy medium! 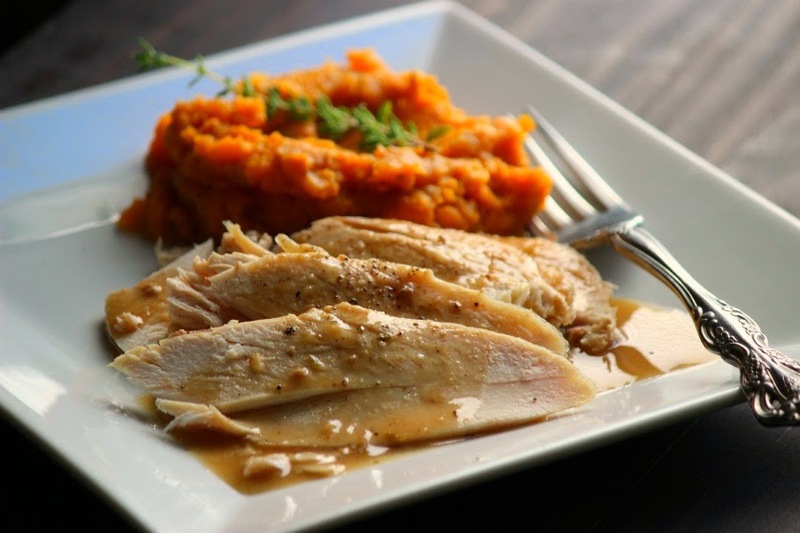 You can make a delicious turkey dinner in your slow cooker without much work at all and without turning on your oven! We can never get enough gravy - and this recipe makes a full quart! Plenty for leftovers and sandwiches. You can make as many sides as you like or just use for some hot turkey sandwiches! I made a small batch of homemade stuffing, some creamy mashed sweet potatoes and of course some cranberry sauce. It really hit the spot! Pat turkey breast dry with paper towels and season with salt, pepper and paprika. Melt butter in slow-cooker pot over medium heat. (If you slow-cooker does not have a browning setting, you can do this on your stove top.) Brown turkey breast, skin side down, about 5 minutes, transfer to plate. Add onion to fat left in the pan and cook over medium heat until softened, about 5 minutes. Stir in flour and cook for 1 minutes. Stir in broth and water and whisk to smooth out any lumps. Using a wooden spoon, scrape up all browned bits stuck on bottom of pot. Add thyme. Place turkey, breast side down in with with any accumulated juices. Cover pot and cook on LOW setting for 5-6 hours or until the internal temperature of the turkey breast reaches 165 degrees F.
Carefully transfer the turkey breast to a cutting board, tent with foil and let rest while preparing gravy. Strain the liquid in the slow cooker into a saucepan. Let settle for about 5 minutes and them skim off fat from the surface. Bring the gravy to a simmer and cook for 15 minutes. If you would like your gravy a little thicker, whisk together a slurry of flour and cold water (about 1 Tbsp. water with 2 Tbsp. water), and simmer an additional 2-3 minutes. Season the salt and pepper as desired. Carve the turkey and serve with hot gravy. This is a great recipe for a Sunday dinner, or for a small family gathering at Thanksgiving. It couldn't be easier! I saw that! I'm going to pick up another one myself and freeze it!